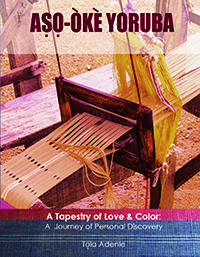 Aṣọ Òkè Yoruba: A Tapestry of Love and Color, A Journey of Personal Discovery, a book gestated on this blog through different categories, was published on Tuesday, February 2, 2016. While a personal website, emotanafricanabooksEtc is being developed where this and any other books, et cetera I may have for sale will be available is undergoing construction, the book is already available for purchase through amazon.com; Amazon (UK), and Amazon Continental Europe. Aṣọ Òkè Yoruba is much more than the old materials from the various categories from the blog. The book contains 144 pages of photographs, literature, including a whole chapter on Yoruba alphabets, pronunciations, accents, and other important facts to help a non-Yoruba navigate the well-produced book. You can be the first to review the book by ordering your copy today through amazon.com. The personal website will soon be linked to this blog. Follow the two pdf links below to see two images for Aṣọ Òkè Yoruba‘s cover and a photograph of a stunning ancient piece of sanyan from Yorubas’ sericulture past. Front & Cover of Aṣọ Òkè Yoruba. Finally got the copy on Tuesday night and I read it through the night! E ku’se gaan ni Ma. It is instructive and entertaining. I myself am going back to it as a book of reference on the subject for years to come. The Crash Course was a hit with my daughters and your take on “Yoruba betrothal and accompanying bizarre bazaar” in Chapter Twelve has totally nailed the conversations about “something small” in Nigeria!!! I’ll be sharing the link to the website on my Facebook page and directly to all my contacts at home and in diaspora. Once again, CONGRATULATIONS to you, Uncle Depo, Joke and all the members of the team. A million thanks forthe feedback which makes it imperative for emotanafricanabooks.com to be made interactive. As soon as I get help doing that,your comments which belong there, would be thefirst to go up. I appreciate and thank you for your generous words and the promised help to spread the word on ASO OKE YORUBA. Congratulations Mrs Adenle! I received my copy on Sunday. I have always loved the old style Aso Oke – I inherited my grandmother’s funeral two piece from late 60’s, they are unique – flipping through your book brings back memories. I have not read it yet but will certainly get to it shortly. Thank you for sharing and for keeping the history alive. Oh, w-o-w! The very first non-family comments on my new book for which I thank you immensely. I am really happy that you like it, and will like to hear from you after you would have had the time to sit down with the book and check out the various areas it deals with, including the chapter on A CRASH COURSE IN YORUBA LANGUAGE. The website is ready and you should check it out. A URL should be in place by week’s end to link the blog with the website so that the heavy traffic here can send people to check out the site where they can purchase the book at a little discount – which I owe you when in England for the signing I mentioned – for people who buy direct from me although their orders will still be filled by Amazon’s CreateSpace. The link to the site is below. Congrats on the book! I look forward to purchasing one, and reading about our beautiful Yoruba heritage of ‘Aso Oke’! Congrats again, and continued ‘happy writing’! Nice to HEAR your voice! Thanks, too, for the good wishes. I’m sure you will not be disappointed with either the contents or the production quality.